The number of journalists killed worldwide for their work nearly doubled this year. That information comes from a new report by the Committee to Protect Journalists. The New York-based group reported that 34 journalists were killed because of their work as of December 14, while at least 53 were killed in all. That compares to 18 retaliation killings among the 47 deaths confirmed by the committee in 2017. The new report lists the name of Jamal Khashoggi, who wrote opinion pieces for The Washington Post. Khashoggi was a native of Saudi Arabia, but fiercely critical of its ruling family. He went missing on October 2 during a visit to Saudi Arabia’s diplomatic offices in Istanbul. Turkish officials claim he was attacked and killed inside the consulate. U.S. Secretary of State Mike Pompeo announced last week that the United States is still investigating the killing. However, the Central Intelligence Agency found that Saudi Crown Prince Mohammed bin Salman was involved in Khashoggi’s murder. 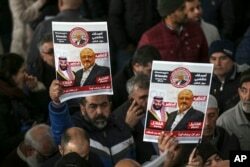 FILE - In this Nov. 16, 2018 file photo, members of Arab-Turkish Media Association and friends of Washington Post columnist Jamal Khashoggi hold posters showing images of Saudi Crown Prince Muhammed bin Salman and of Khashoggi. In addition to retaliation killings, media workers have died in armed conflicts or on dangerous reporting assignments. The deadliest country for journalists in 2018 has been Afghanistan, where 13 journalists were killed, the report said. Some died from suicide bombers whose actions were claimed by the militant group Islamic State. Media rights group Reporters Without Borders noted that the United States made it into the top five deadliest countries for journalists this year for the very first time. 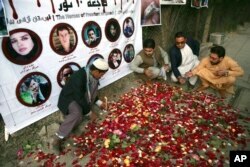 Six journalists were killed nationwide. They included four who were among five people killed by a gunman who attacked the offices of Maryland’s Capitol Gazette newspaper on June 28. The shooting was the deadliest single attack on the media in recent U.S. history. The man had lost a defamation case against the newspaper. 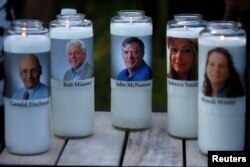 Two other journalists died while reporting on extreme weather conditions. In addition, the committee said the imprisonment of journalists has been on the rise. “Changes in technology…have allowed more people to practice journalism,” the committee said. It added that the same technology has made journalists less important to criminal groups who once needed the media to spread their message. FILE - In this May 3, 2018 file photo, Afghan residents light candles to pay tribute to Afghan journalists killed three days earlier in a suicide attack in Kabul, Afghanistan. Time magazine last week recognized jailed and killed journalists as its “person of the year.” By name, they included Khashoggi and workers at the Maryland newspaper. The other honorees were reporters Wa Lone and Kyaw Soe Oo, jailed in Myanmar, and Maria Ressa, held in the Philippines. Journalists have died this year in Slovakia, where 27-year-old reporter Jan Kuciak was shot while investigating suspected corruption. The committee said that at least four journalists were murdered in Mexico, two in Brazil and two Palestinian journalists were killed by Israeli soldiers during protests in the Gaza Strip. In Syria and Yemen, two countries with violent civil wars, the fewest journalists were killed since 2011. Three were killed in Yemen. In Syria, the committee recorded nine deaths compared to a high of 31 in 2012. The Associated Press reported this story. Susan Shand adapted this story for Learning English. George Grow was the editor.